For the last eight years I have worked for Frontier High School, an alternative high school in Elizabeth, Colorado. It is a school determined to bring back the joy of education to those who have been disillusioned by the traditional methods of teaching in a culture that is more interested in testing students rather than educating them. I have been proud of the fact that this small staff at this school has been able to turn around the lives of kids who other schools have written off as trouble-makers, or unable to reach. I’m not saying that every educator out there is so callous as to dismiss one of their students, but there are enough of them out there to not care about any individual that causes disruption in their classroom. These educators would rather ignore these students in need than give them the time needed so they could obtain a proper education. For the most part these students end up at my school, or schools like mine. They find themselves there for various reasons: drugs, gangs, struggles in learning, disruptive home lives, poverty, or bullying for various reasons of teenage awkwardness. Frontier High School is there to give these kids a chance. There are many things that this school does to bring these kids into the fold of lifelong learners. The one that I enjoyed the most during my tenure there was the experiential education program. This program allowed students to learn by getting out of the classroom and seeing the world around them. Moments like this bring learning to life. I have been on a lot of these trips during my time there. I went skiing on the slopes of Colorado, explored the caves in Carlsbad, New Mexico, and hiked the less traveled paths of Yellowstone National Park with my students. Each time I went on one of these adventures I learned just as much about the history of our nation and the way the world works as my students did. They were experiences that they will always be able to take with them, and in the process I was able to make great academic relationships with my students and show them a way to a more promising future. It has been a rewarding experience, and sometimes I wonder who got more out of the experience, them or me. My last trip there was to the beauty of Moab, Utah. Our voyage on this trip took us to many exciting places. We went to two national parks, Arches and Canyonlands, and a canoe trip down the Colorado River. 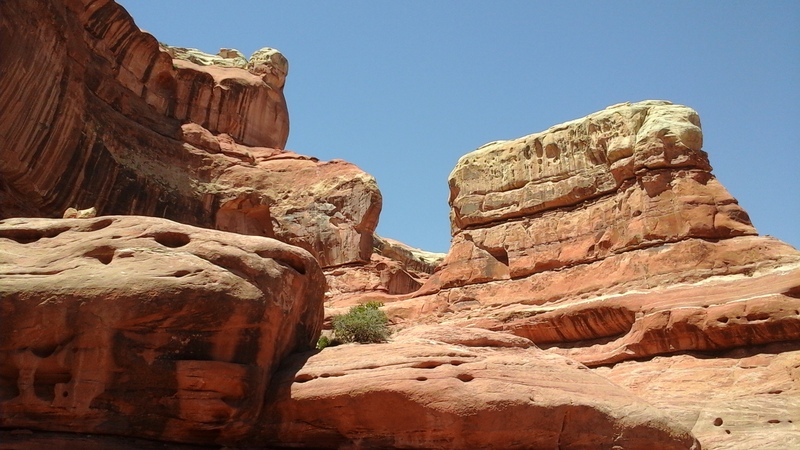 The first day was an eight mile loop through the slick rock that is Canyonlands National Park. We learned about the formation of these canyons while running into the wildlife that found a home in this desolate place. There were many lizards scurrying over the same rocks that we were, and when we looked in the sky, we saw hawks soaring to hunt these same lizards. The students learned about the power of the desert as the sun sweltered in the sky, and we sweated under the exposure of its brutal landscape. Luckily, we were there in early June, so it was only in the nineties. I couldn’t imagine what it would be like in August when temperatures reach well over the one-hundred degree mark. It was a little bit of a challenge for my fellow teacher, Jed, and me, but it was more of a challenge for some of our students who have never been on an exposition like this before. The next day was spent on the Colorado River. Even though we were given lessons on eddies, strainers, and how to navigate through them in a canoe, we were given an unexpected lesson in physics. One of our members of the trip backed out a couple of days before we left, so we were left with a odd number. We had arranged with the rental company, Moab Rafting, for ten people in five canoes, so they had prepared that many for us. Once again luck was on our side, or so we thought. One of the canoes they pulled out was smaller, so one person could navigate the river with it. Jed, being the more skilled, opted to take the canoe down the river by himself. We quickly learned our mistake in letting him alone in a boat. His weight lifted the front of the boat out of water, and we quickly experienced a headwind right before heading into the canyon. The four boats with two passengers moved swiftly down the river, whereas he lagged behind. Quickly, Jed and his boat became a tiny dot on the horizon. This is where the kids’ problem solving skills came into play. The other four canoes formed a barge and waited for him to catch up. When he was finally with us, we tied the end of his boat to one of ours and guided him down the stream. It still wasn’t as fast as the other boats, but he no longer lagged so far behind that we were scared of losing him completely. Even with all of the difficulty we experienced as we made our way down the Colorado River, the fact that recent rains had pushed its limits to the highest banks and gave power to its current, we arrived at the pullout an hour ahead of schedule. We spent a little time enjoying lunch and then joined another group of students that took turns leaping off an outcrop of rock into a deeper part of the river. The water was refreshing and it was the perfect activity for a hot, sunny day. The day wasn’t over when we completed our river excursion. Across the road from the pullout was a trail head. We returned later that evening to take this short hike. 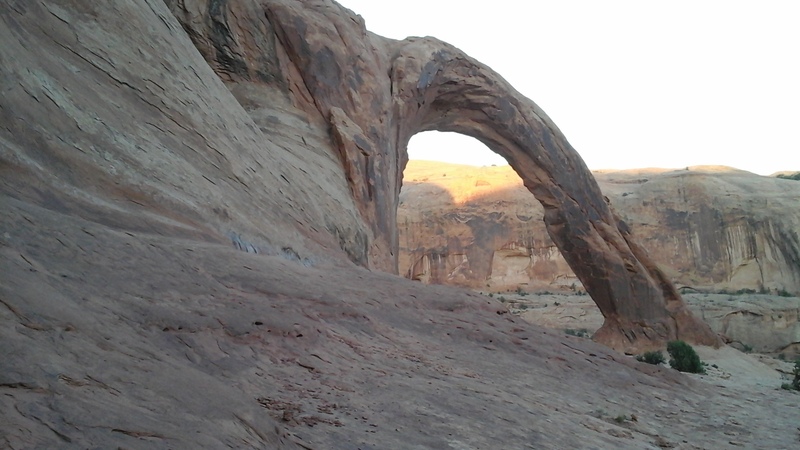 It was enjoyable in the cool of the early evening and we were able to see our first natural arch. These majestic sculptures are created after years of being punished by the elements. Rains and winds carve out these arches to last decades and centuries, but they are a part of a constantly changing landscape subjected to the whims of nature. Even though I could probably come back ten years later and still see this same arch, it is not a guarantee. There are always stories of arches who have lost their battles to time, and eventually this one will too. All we can do is enjoy their beauty while they last and search for the new ones as the elements give them their unique characteristics. Arches National Park has the largest collection of these arches. They are all over the place, and many small hikes crowded with tourists from around the world took us to the more iconic ones on our last full day on this trip. Delicate Arch is the most well known of the arches. From a slightly different angle than this picture, one can see the image emblazoned on the license plates of many Utah cars. It is one of the more unique arches that we found in the park. Most times, the arches are attached to cliffs that are a part of the whole weathering process, but Delicate Arch is out there by itself, attached to nothing. Even though the mile-and-a-half hike to see this landmark is strenuous, it doesn’t stop tourists gathering around the natural amphitheater surrounding this structure and spending time watching people take their turns standing on the platform under the arch to get their picture taken. It was fun to watch the different poses that people attempted as they tried to balance themselves against the wind. Even though there are a lot of educational opportunities that the students experience as we travel to the different sites on each of our trips, one of the greatest experiences that happens is the bonding an individual creates between the fellow students and the teachers. This usually happens at the campsites. Yes, the students learn about camping, conservation, outdoor cooking, and how to start a fire during their stays at these campsites, but they also laugh as they play various games and enjoy the friendly banter that can only be enjoyed around a campfire. I learned a couple of new activities on this trip such as Extreme Spoons, and the roasting of Starbursts (quite a delicacy if you have never tried it), but the game that brought out the most laughter and the biggest challenge among the kids was Chubby Bunny. This is usually played while waiting to make smores. 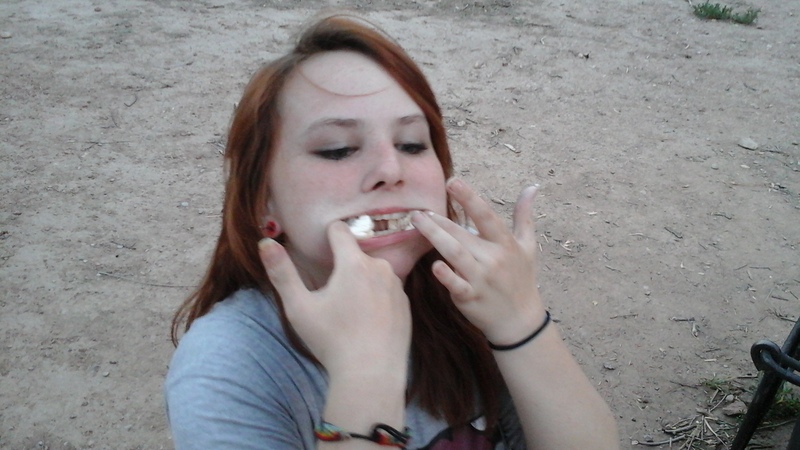 The contestants take a marshmallow and stuff it into their mouths without chewing it. They must say the phrase, “I am a Chubby Bunny” in order to continue. The contestants take turns stuffing these fluffy treats into the maw until only one of them is able to utter the phrase as their mouths are overflowing with marshmallows. The record on this trip was nine marshmallows held by Jed. Even though the kids lost to a teacher, it created a wonderful moment that the students will take with them for the rest of their lives. 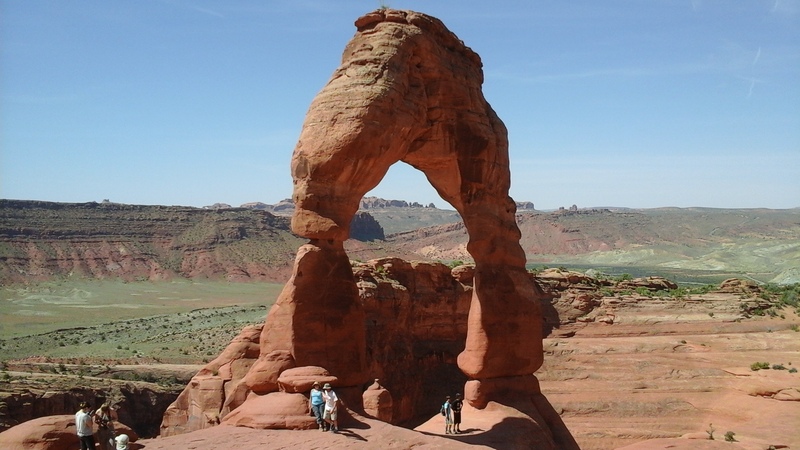 This trip to Moab, Utah will be placed among the top trips that I have taken with Frontier High School. It was the perfect way to say goodbye to a place that allowed me to grow as a teacher and be able to see the importance that education holds in our society. Even though I will not be returning to Frontier High School next year, I will always be a soaring eagle, and I will look back at these trips with fond memories. It is a program that I hope will continue in the future because not only is it a great learning opportunity for these kids, but it also gives them a chance at a future because it shows them that there is a whole world out there for them to connect with. It is programs like the experiential education program at Frontier High School that should be implemented in more schools across America. They would show disenfranchised students that there is more to education than books and tests. If you find one of these programs in your local school districts make sure that it survives because it is so essential to so many students out there.